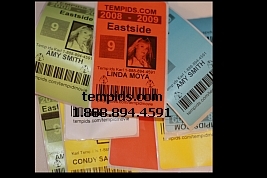 TempIDs.com is the leading source for your temporary id badge needs. Temp IDs also known as Temporary ID badges also known as Temporary ID labels are for the most part sticky labels that are usually similar in appearce to a regular identification card since it has the bearer's name and sometimes their picture that are distributed to those that don't have their hard card ID badge with them. The Temporary ID badge is given out as a short term replacement for the regular ID card. There are many types of temporary id badges and tempids.com covers the four basic types of temp ids here.